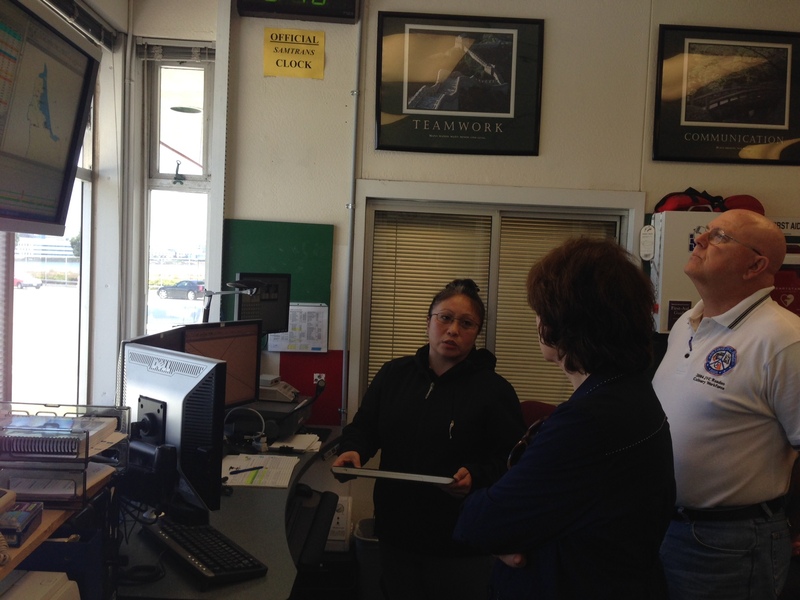 Board Director Rose Guilbault Continues Her Tour of District Facilities with a Visit to SamTrans Base – Peninsula Moves! Director Rose Guilbault gets a tour of North Base dispatch center from Deputy CEO Operations Chuck Harvey. Rose Guilbault, who sits on both the Caltrain and SamTrans’ board of directors, continued her behind-the-scenes tour of District facilities with a visit to the SamTrans’ operating bases last week. In June, Guilbault accompanied Deputy CEO Chuck Harvey on a tour of the Caltrain operation and maintenance center, getting a close look at the challenges facing the agency, and the dedicated workers committed to tackling those issues. Last week, she again accompanied Harvey to see the inner workings of the Peninsula public transportation network, this time with a visit to SamTrans, which, like Caltrain, is overseen by the San Mateo County Transit District. The tour began at SamTrans’ North Base facility in South San Francisco, where the agency’s buses are maintained, housed and dispatched onto their daily routes. Guilbault was able to meet the mechanics, operators, bus controllers and other employees at the base that help make the system work. Guilbault surveyed the bus control center, where dispatchers meticulously monitor the system through new GPS technology that pinpoints the status and location of every SamTrans vehicle. There, she was able to get a first-hand view into the work that provides the basis for the SamTrans’ values of safety, reliability and service quality. Following that visit, Guilbault moved on to the maintenance and operation training centers on the second floor of the North Base facility, where she watched a test run on the SamTrans simulator, a video-game like machine with a monitor and steering wheel that recreates street conditions for prospective operators. Harvey and Guilbault then made their way to the SamTrans garage, where the buses are maintained, repaired and rehabilitated. Although the facility was running without a hitch, Harvey explained to Guilbault that 50 percent of the mechanics onsite are due to retire in five years, leaving SamTrans with a large source of institutional knowledge to replace. That potentially frightening scenario is the reason Harvey and SamTrans have embarked on a new apprenticeship program, where mechanics and other maintenance workers can receive top-notch training so they enter the SamTrans workforce fully prepared to replace their peers. Guilbault said that meeting the frontline SamTrans workers and hearing their stories is critical to helping inform her decision-making as a board member. Along with checking out North Base, Guilbault stopped by SamTrans’ South Base facility in San Carlos, and the Redwood City offices of MV Transportation, a private company that is contracted by SamTrans to run its paratransit operations.